In love and life, it’s the small things that’ll getcha. Speaking of heartbreak, some romances and marriages end in a big way, often because of an unfaithful partner. Many more fail because of accumulated annoyances, slights and neglects. Shakespeare put the words in Juliet’s mouth, “(Love) pricks like a thorn.” I think it’s no coincidence that Cupid shoots tiny arrows. The man’s an idiot. If a bee stings, I won’t ignore it. It might not matter in a hundred years. But what if it does? What if that stinger is still lodged in my skin years from now, tormenting me every day for a hundred years? That kind of thinking is no comfort. After I stop cursing, I just cut the stinger out. Carlson subtitled his book, “(And it’s all small stuff).” He got that right. And, I’ll add, all the small things want to get us. Speaking of bites, I once worked as a door-to-door salesman selling encyclopedias in central Missouri. Like all oldtime “drummers,” I grew wary of loose dogs. I rarely had any trouble with shepherds, labradors or any big canine. Pit bulls? The owners tied ’em up or fenced them in. No, the real danger came from ankle-biters � Maltese, fox terriers, Pekes � all small dogs with needlesharp tiny teeth and attitude. Small stuff is out to get you, even if it’s not alive. Last month a water glass slipped out of my hand and broke on the kitchen floor. I picked up the big pieces and swept up the small ones. The floor seemed a little dirty, so I mopped it, too. You can guess what happened next, because it’s happened to you, hasn’t it? The very next time I walked in, barefoot, a near-microscopic shard of broken glass embedded itself in my heel. Dogs two blocks away started howling when I screamed. The small ones came running to chew on my carcass. OK, I’m exaggerating a little. Seriously, though, some scientists, engineers and public policymakers share very real concerns about the smallest “stuff” coming out of laboratories and industries. I’m talking about nanotechnology � structures and compounds manufactured at molecular scales. In this column, I propose that today’s technology and its effects on society often can be understood and interpreted because it evolved from older technology we’ve already seen. That’s not true of nanotechnology in any sense, starting with the fact that it’s too small to see. I was 10 years old when physicist Richard Feynman, in a now-famous lecture called “There’s Plenty of Room at the Bottom,” proposed making small tools to create smaller tools that could make evensmaller ones until you had tools so tiny they could manipulate individual atoms and molecules. I finished college a year before Norio Taniguchi coined the word “nano-technology.” I had started my third career when Eric Drexler’s 1986 book, “Engines of Creation,” touched off a scientific and engineering revolution. Little in my experience prepared me for nanotechnology. My first introduction was reading Drexler’s book. It’s the industrial version of the organic processes that build babies into adults, seeds into trees and fish eggs into salmon and sharks. Cells operate as little chemical-powered factories that assemble molecules into copies of themselves and � following a program stored in DNA’s complex code � into other specialized cells and eventually into large structures such as skin, bone, veins, cartilage, nerves and Anna Nicole Smith. In the past 20 years, nanotechnology has become one of the hottest fields in science and engineering. Despite the lessons of the dot-com meltdown in the 1990s, investors still pump millions of dollars into almost any startup company with “nano” in its name. A current survey found more than 200 “nano” products already on the commercial market (the list, updated frequently, is at http://www.nanotechproject.org). In High Point only 10 days ago, entrepreneurs, scientists and investors wrapped up the 2006 Nanotechnology Conference after hearing presentations from nine North Carolina-based nanotechnology companies, including NanoTech Labs in Yadkinville. Now you know I’m suspicious of small stuff. Did I mention the size of nanotechnology? The U.S. government defines it as processes, substances and objects at a scale of 1 to 100 nanometers. Some nanotechnologists say the lower limit should be 0.1 nanometers. At that size, they’re splitting hairs, literally and figuratively. A human hair is 10,000 nanometers wide. Seen another way (using an electron microscope and very tiny tweezers), you could line up 3,527 100-nanometer-wide gears across the period at the end of this sentence. To give the man his due, Eric Drexler warned in “Engines of Creation” about a potential hazard in nanotechnology. It’s now known as “the gray goo scenario.” The idea is that selfreplicating nanobots might go out of control and disassemble the earth’s organic structures � including you and me � into basic components. You’d be surprised how many researchers take that idea seriously. Personally, I’m more worried that nanocrystals in my wife’s eye shadow will coat her brain a lovely shade of Indigo Moon or Rose Confetti... in the future. 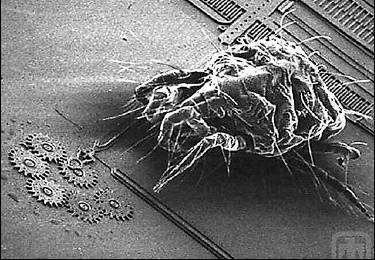 A dust mite inspecting some gears made with nano technology.